Tim Smith former botanist and now obmudsman for Missouri Dept. of Conservation corrected identification of the yellow flowers The golden flowers are a species of Spanish needles, aka beggar ticks, aka tickseed sunflower genus Bidens. Wet conditions this year have probably favored that genus. It does proliferate in disturbed soils such as a recent prairie planting would provide. Growth habit: Upright to loose mound. Flowers: The 1- to 2.5-inch yellow to orange flowers bloom from late spring through summer if deadheaded. Flower stems rise to nearly 2 feet. 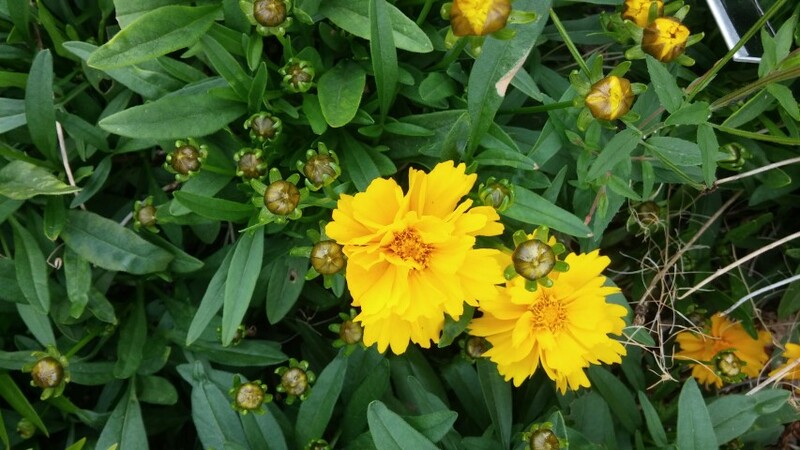 Coreopsis x ‘Early Sunrise’ reaches 18 inches tall with bright yellow flowers summer through autumn. Coreopsis x ‘Jethro Tull’ has interesting, tubular ray florets (above). C. lanceolata is similar to C. grandiflora except the upper portions of its stems are not leafy, while the leaves are not as deeply lobed and may be entire. C. auriculata is known as Mouse Ear Coreopsis. C. tinctoria is called Golden Coreopsis or Tickseed. C. verticillata is Threadleaf Coreopsis. All are native to the United States.